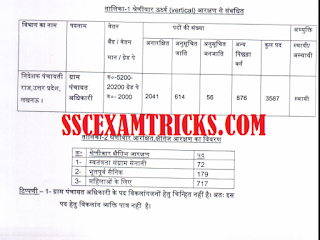 UPSSSC Recruitment 2015 Released - Download UP Gram Vikas Adhikari 3587 Vacancies upsssc.gov.in. Latest Government Jobs Alert: UPSSSC Recruitment 2015 has become available from 22nd June 2015 to 13th July 2015 for 3587 vacancies of UP Gram Vikas Adhikari in various UP Government Deparments. The direct link to download UPSSSC Recruitment 2015 Official Advertisement for 3587 vacancies of Gram Vikas Adhikari in UP can be downloaded from here. Candidates must remind that the last date of payment of application form will be 11th July 2015. No. of Vacancies of UP Gram Vikas Adhikari in UPSSSC Recruitment 2015: Total 3587 vacancies are available on official website www.upsssc.gov.in for UP Gram Vikas Adhikari posts. Uttar Pradesh Sub-Ordinate Service Commission (UPSSSC) released category wise vacancies of Gram Vikas Adhikari in which 2041 vacancies for General category candidates, 876 vacancies for OBC category candidates, 614 vacancies for SC category candidates and 56 vacancies for ST category candidates. Eligibility / Qualification for UP Gram Vikas Adhikari Recruitment 2015: Candidates must be passed 12th / Secondary School from recognized board. Candidates must possess CCC Certificate from DOEACC society. Age Limit for UP Gram Vikas Adhikari Recruitment 2015: Candidates must be not less than 18 years and not more than 40 years of age. Relaxation to reserve category will be provided as per Uttar Pradesh Government Rules. Important Dates of UP Recruitment 2015 Gram Vikas Adhikari Vacancies: The start date of UPSSSC official advertisement is 22nd June 2015. The end date to apply online for UPSSSC Recruitment for Gram Vikas Adhikari posts 13th July 2015. It is advised to the candidates that they must read UP Gram Vikas Adhikari Official Advertisement before applying for UPSSSC Recruitment 2015. During the reading of UP Gram Vikas Adhikari advertisement, candidates note down process to apply online, age limit, eligibility, total vacancy, category wise vacancy details, pay scale, grade pay, category numbers which are mentioned there and will be useful at the time of applying online for registration of the candidates for recruitment of 3587 posts of Gram Vikas Adhikari in UP. How to apply online for UPSSSC Recruitment 2015 for Gram Vikas Adhikari Posts: Candidates will have to mind three steps to apply online for Gram Vikas Adhikari posts in UPSSSC. These steps to apply online application forms are given here. First is User Instructions in which candidates will have to read Instructions to apply online for UP Gram Vikas Adhikari posts. Second is view advertisement in which candidates will have to download official advertisement and read carefully before applying online application form for Gram Vikas Adhikari Recruitment 2015. Finally candidates can apply online through direct link given on this page. Online application form will be filled during apply online for UPSSSC Recruitment 2015. Final Selection Process for UP Gram Vikas Adhikari posts in UPSSSC: The final selection of eligible candidates for UPSSSC Recruitment 2015 of 3587 Vacancies of Gram Vikas Adhikari will be based on merit prepared on the performance in Screening Test (In case of large numbers of application) and personal interview.